Patients typically present with a waxing and waning, pruritic eruption on the extensor surfaces of the arms, knees, and buttocks. It may become generalized. Small vesicles may have been noted but have often been excoriated by the time of presentation to the physician. They may have associated worsening of disease with dietary intake of gluten. Many do not report any GI symptoms, even when prompted. The diagnosis is suspected based on the distribution of the eruption. Flesh-colored–to–erythematous excoriated papules or plaques with herpetiform (ie, small, clustered) vesicles are symmetrically distributed over extensor surfaces, including the elbows, knees, buttocks, and shoulders. Dermatitis herpetiformis rarely occurs on the posterior (nuchal) scalp and face. Lesions occur infrequently on the oral mucosa, but males are more likely than females to have involvement of the oral and genital membranes. Palms and soles are spared. Digital purpura resembling vasculitis can occur. Erythematous papules and urticarialike plaques occur less frequently; bullae are rare. The eruption is intensely pruritic; patients often present with erosions and crusts in the absence of vesicles, which have ruptured due to excoriation. Typical symptoms include burning, stinging, and intense itching. Rarely, if ever, are patients totally asymptomatic, although the degree of itching varies. Dermatitis herpetiformis is a lifelong disease, although periods of exacerbation and remission are common. Polymorphic lesions on extensor surface of arm. Complications are related to the gluten-sensitive enteropathy, the risk of developing lymphomas, and the potential adverse effects of medications, particularly dapsone. Duhring L. Dermatitis herpetiformis. JAMA. 1884. 3:225. Arbache ST, Nogueira TG, Delgado L, Miyamoto D, Aoki V. Immunofluorescence testing in the diagnosis of autoimmune blistering diseases: overview of 10-year experience. An Bras Dermatol. 2014 Nov-Dec. 89 (6):885-9. [Medline]. Plotnikova N, Miller JL. Dermatitis herpetiformis. Skin Therapy Lett. 2013 Mar. 18(3):1-3. [Medline]. Sardy M, Karpati S, Merkl B, Paulsson M, Smyth N. Epidermal transglutaminase (TGase 3) is the autoantigen of dermatitis herpetiformis. J Exp Med. 2002 Mar 18. 195(6):747-57. [Medline]. Hull CM, Liddle M, Hansen N, et al. Elevation of IgA anti-epidermal transglutaminase antibodies in dermatitis herpetiformis. Br J Dermatol. 2008 Jul. 159(1):120-4. [Medline]. Marietta EV, Camilleri MJ, Castro LA, Krause PK, Pittelkow MR, Murray JA. Transglutaminase autoantibodies in dermatitis herpetiformis and celiac sprue. J Invest Dermatol. 2008 Feb. 128(2):332-5. [Medline]. Cannistraci C, Lesnoni La Parola I, et al. Co-localization of IgA and TG3 on healthy skin of coeliac patients. J Eur Acad Dermatol Venereol. 2007 Apr. 21(4):509-14. [Medline]. Samolitis NJ, Hull CM, Leiferman KM, Zone JJ. Dermatitis herpetiformis and partial IgA deficiency. J Am Acad Dermatol. 2006 May. 54(5 Suppl):S206-9. [Medline]. Hall RP 3rd, Benbenisty KM, Mickle C, Streiien RD. Serum IL-8 in patients with dermatitis herpetiformis is produced in response to dietary gluten. J Invest Dermatol. 2007 Sept. 127(9):2158-67. [Medline]. Hall RP 3rd, Takeuchi F, Benbenisty KM, Streilein RD. Cutaneous endothelial cell activation in normal skin of patients with dermatitis herpetiformis associated with increased serum levels of IL-8, sE-Selectin, and TNF-alpha. J Invest Dermatol. 2006 Jun. 126(6):1331-7. [Medline]. Dahl MV, Falk RJ, Carpenter R, Michael AF. Membrane attack complex of complement in dermatitis herpetiformis. Arch Dermatol. 1985 Jan. 121(1):70-2. [Medline]. Zebrowska A, Wagrowska-Danilewicz M, et al. Expression of selected ADAMs in bullous pemphigoid and dermatitis herpetiformis. Journal of Dermatological Science. 2009. 56:58-73. Grimwood RE, Guevara A. Leuprolide acetate-induced dermatitis herpetiformis. Cutis. 2005 Jan. 75(1):49-52. [Medline]. Caproni M, Torchia D, Antiga E, et al. The role of apoptosis in the pathogenesis of dermatitis herpetiformis. Int J Immunopathol Pharmacol. 2005 Oct-Dec. 18(4):691-9. [Medline]. Smecuol E, Sugai E, Niveloni S, et al. Permeability, zonulin production, and enteropathy in dermatitis herpetiformis. Clin Gastroenterol Hepatol. 2005 Apr. 3(4):335-41. [Medline]. Bardella MT, Fredella C, Saladino V, et al. Gluten intolerance: gender- and age-related differences in symptoms. Scand J Gastroenterol. 2005 Jan. 40(1):15-9. [Medline]. Templet JT, Welsh JP, Cusack CA. Childhood dermatitis herpetiformis: a case report and review of the literature. Cutis. 2007 Dec. 80(6):473-6. [Medline]. Swerdlow AJ, Whittaker S, Carpenter LM, English JS. Mortality and cancer incidence in patients with dermatitis herpetiformis: a cohort study. Br J Dermatol. 1993 Aug. 129(2):140-4. [Medline]. Lewis NR, Logan RF, Hubbard RB, West J. No increase in risk of fracture, malignancy or mortality in dermatitis herpetiformis: a cohort study. Aliment Pharmacol Ther. 2008 Jun 1. 27(11):1140-7. [Medline]. Viljamaa M, Kaukinen K, Pukkala E, Hervonen K, Reunala T, Collin P. Malignancies and mortality in patients with coeliac disease and dermatitis herpetiformis: 30-year population-based study. Dig Liver Dis. 2006 Jun. 38(6):374-80. [Medline]. Hervonen K, Vomanen M, Kaitiainen H, Collin P, Reunala T. Lymphoma in patients with dermatitis herpetiformis and their first-degree relatives. Br J Dermatol. 2005 Jan. 152(2):82-6. [Medline]. Hardman CM, Garioch JJ, Leonard JN, et al. Absence of toxicity of oats in patients with dermatitis herpetiformis. N Engl J Med. 1997 Dec 25. 337(26):1884-7. [Medline]. Garsed K, Scott BB. Can oats be taken in a gluten-free diet? A systematic review. Scand J Gastroenterol. 2007 Feb. 42(2):171-8. [Medline]. Al-Niaimi F,Cox NH,Lewis-Jones S. Dermatitis herpetiformis exacerbated by cornstarch. JAAD. 2010. 62:510-511. Accetta P, Kumar V, Beutner EH, Chorzelski TP, Helm F. Anti-endomysial antibodies. 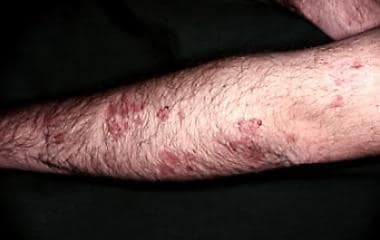 A serologic marker of dermatitis herpetiformis. Arch Dermatol. 1986 Apr. 122(4):459-62. [Medline]. Schulze F, van Beek N, Terheyden P, Zillikens D, Schmidt E. Concomitant Bullous Pemphigoid and Dermatitis Herpetiformis. Dermatology. 2013 Jun 14. [Medline]. Gaspari AA, Huang CM, Davey RJ, Bondy C, Lawley TJ, Katz SI. Prevalence of thyroid abnormalities in patients with dermatitis herpetiformis and in control subjects with HLA-B8/-DR3. Am J Med. 1990 Feb. 88(2):145-50. [Medline]. Helsing P, Froen H. Dermatitis herpetiformis presenting as ataxia in a child. Acta Derm Venereol. 2007. 87(2):163-5. [Medline]. Sigurgeirsson B, Agnarsson BA, Lindelöf B. Risk of lymphoma in patients with dermatitis herpetiformis. BMJ. 1994 Jan 1. 308(6920):13-5. [Medline]. [Full Text]. Hassan S, Dalle S, Descloux E, Balme B, Thomas L. [Dermatitis herpetiformis associated with progesterone contraception]. Ann Dermatol Venereol. 2007 Apr. 134(4 Pt 1):385-6. [Medline]. George DE, Browning JC, Hsu S. Medical pearl: dermatitis herpetiformis--potential for confusion with eczema. J Am Acad Dermatol. 2006 Feb. 54(2):327-8. [Medline]. Alonso-Llamazares J, Gibson LE, Rogers RS 3rd. Clinical, pathologic, and immunopathologic features of dermatitis herpetiformis: review of the Mayo Clinic experience. Int J Dermatol. 2007 Sep. 46(9):910-9. [Medline]. Antiga E, Verdelli A, Calabrò A, Fabbri P, Caproni M. Clinical and immunopathological features of 159 patients with dermatitis herpetiformis: an Italian experience. G Ital Dermatol Venereol. 2013 Apr. 148(2):163-9. [Medline]. Desai AM, Krishnan RS, Hsu S. Medical pearl: Using tissue transglutaminase antibodies to diagnose dermatitis herpetiformis. J Am Acad Dermatol. 2005 Nov. 53(5):867-8. [Medline]. Sardy M, Csikos M, Geisen C, et al. Tissue transglutaminase ELISA positivity in autoimmune disease independent of gluten-sensitive disease. Clin Chim Acta. 2007 Feb. 376(1-2):126-35. [Medline]. Smith JB, Taylor TB, Zone JJ. The site of blister formation in dermatitis herpetiformis is within the lamina lucida. J Am Acad Dermatol. 1992 Aug. 27(2 Pt 1):209-13. [Medline]. Madan V, Jamieson LA, Bhogal BS, Wong CS. Inflammatory epidermolysis bullosa acquisita mimicking toxic epidermal necrolysis and dermatitis herpetiformis. Clin Exp Dermatol. 2009 Jul 29. [Medline]. Van L, Browning JC, Krishnan RS, Kenner-Bell BM, Hsu S. Dermatitis herpetiformis: potential for confusion with linear IgA bullous dermatosis on direct immunofluorescence. Dermatol Online J. 2008 Jan 15. 14(1):21. [Medline]. [Full Text]. Ko CJ, Colegio OR, Moss JE, McNiff JM. Fibrillar IgA deposition in dermatitis herpetiformis-an underreported pattern with potential clinical significance. Journal of cutaneous pathology. 2010. 37:475-477. Ciacci C, Ciclitira P, Hadjivassiliou M, Kaukinen K, Ludvigsson JF, McGough N, et al. The gluten-free diet and its current application in coeliac disease and dermatitis herpetiformis. United European Gastroenterol J. 2015 Apr. 3 (2):121-35. [Medline]. Koskinen O, Villanen M, Korponay-Szabo I, et al. Oats do not induce systemic or mucosal autoantibosy response in children with coeliac disease. Pediartic Gastroentol Nutr. 2009. 48:559-65. Reunala T, Collin P, Holm K, et al. Tolerance to oats in Dermatitis Herpetiformis. Gut. 1998. 43:490-493. Thompson, T, Lee AR, Grace T. Gluten Contamination of Grains, Seeds and Flours in the United States: A pilot study. American Diabetic Association. 2010. 110:967-940. Thompson T, Dennis M, Higgins LA, Lee AR, Sharrett MK. Gluten free diet survey: are Americans with coeliac disease consuming recommended amounts of fiber, iron, calcium and grain foods. J Hum Nutr Diet. 2005. 18:163-9. Paek SY, Steinberg SM, Katz SI. Remission in dermatitis herpetiformis: a cohort study. Arch Dermatol. 2011 Mar. 147(3):301-5. [Medline]. Bevans SL, Sami N. Dapsone and sulfasalazine combination therapy in dermatitis herpetiformis. Int J Dermatol. 2017 May. 56 (5):e90-e92. [Medline]. Albers LN, Zone JJ, Stoff BK, Feldman RJ. Rituximab Treatment for Recalcitrant Dermatitis Herpetiformis. JAMA Dermatol. 2017 Mar 1. 153 (3):315-318. [Medline]. Sladden MJ, Johnston GA. Complete resolution of dermatitis herpetiformis with the Atkins' diet. Br J Dermatol. 2006 Mar. 154(3):565-6. [Medline]. Smith JB, Fowler JB, Zone JJ. The effect of ibuprofen on serum dapsone levels and disease activity in dermatitis herpetiformis. Arch Dermatol. 1994 Feb. 130(2):257-9. [Medline]. AGA Institute. AGA Institute Medical Position Statement on the Diagnosis and Management of Celiac Disease. Gastroenterology. 2006 Dec. 131 (6):1977-80. [Medline]. Kadunce DP, McMurry MP, Avots-Avotins A, Chandler JP, Meyer LJ, Zone JJ. The effect of an elemental diet with and without gluten on disease activity in dermatitis herpetiformis. J Invest Dermatol. 1991 Aug. 97(2):175-82. [Medline]. Zeedijk N, van der Meer JB, Poen H, van der Putte SC. Dermatitis herpetiformis: consequences of elemental diet. Acta Derm Venereol. 1986. 66(4):316-20. [Medline]. Lahteenoja H, Irjala K, Viander M, Vainio E, Toivanen A, Syrjanen S. Oral mucosa is frequently affected in patients with dermatitis herpetiformis. Arch Dermatol. 1998 Jun. 134(6):756-8. [Medline]. Losurdo G, Principi M, Iannone A, Amoruso A, Ierardi E, Di Leo A, et al. Extra-intestinal manifestations of non-celiac gluten sensitivity: An expanding paradigm. World J Gastroenterol. 2018 Apr 14. 24 (14):1521-1530. [Medline]. Lakoš Jukić I, Jerković Gulin S, Marinović B. Blistering diseases in the mature patient. Clin Dermatol. 2018 Mar - Apr. 36 (2):231-238. [Medline]. Ollague JE, Nousari CH. Expression of Elafin in Dermatitis Herpetiformis. Am J Dermatopathol. 2018 Jan. 40 (1):1-6. [Medline]. Light micrograph shows neutrophils in the dermal papillae, with fibrin deposition, neutrophil fragments, and edema (hematoxylin and eosin stain). Papillary microabscesses form and progress to subepidermal vacuolization and vesicle formation in the lamina lucida, the weakest portion of the dermoepidermal junction (hematoxylin and eosin stain). Classic vesicles of dermatitis herpetiformis. Immunofluorescence showing immunoglobulin A at the dermoepidermal junction (direct immunofluorescence stain). Disclosure: Received consulting fee from Novan for consulting; Received consulting fee from Stieffel, a GSK company for consulting; Received salary from Society for Investigative Dermatology for board membership. The authors and editors of Medscape Reference gratefully acknowledge the contributions of previous authors, Kristina Collins, MD, and Hunter Sams, MD, to the development and writing of this article.